Some of these items are special order. Please allow a few days additional lead time for delivery. EMI Adjustable Auto Punch (With Power Control Handle) features easy to grip one handed punching power to shatter tempered glass • Adjustable power handle for light or heavy punch • Knurled stainless steel body with hardened steel point • Easy to use • Measures approximately 5 1/2" length x 5/8" diameter • Fits most holsters, jump kits, etc. Lifesaver™ Hammer Basic double sided steel striking heads are specially designed to shatter side windows. 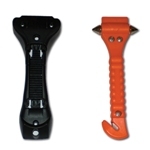 A concealed razorsharp blade allows the individual to easily cut through safety belts. Lifesaver™ Hammer Basic also comes with a mounting cradle, and is an essential rescue tool for Fire, EMS and Law Enforcement. It is approximately 6 3/4" in length and weighs 4.5 oz. EMI introduces the first and only seat belt cutters that can float. 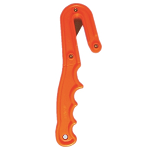 Life-Float II™ cutters are made of a buoyant PVC plastic. The blades are stainless steel to prevent rust or corrosion. Cut through seat belts and other material quickly, easily and safely, and are excellent for water related rescues and emergencies. Life-Float II™ with its built in O2 wrench measures 6 3/4" x 1 1/4". Heavy duty line cutter with 2 spare blades. 400 series stainless steel snips easily cut through line, net, rope, kelp and thin steel cable. Works well in emergency situations where a knife might not. New Mini Sea Snips are 20% smaller than the original!